By adjusting the preload, we change how much the shock initially resists being compressed. 1. The maximum amount of preload length is 5mm. 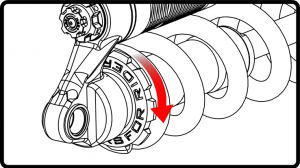 Going further can cause the spring to be loaded outside of it’s intended design that could result in a failure and void the manufacturer warranty. 2. Rotating the preload collar clockwise will increase spring preload. 3. 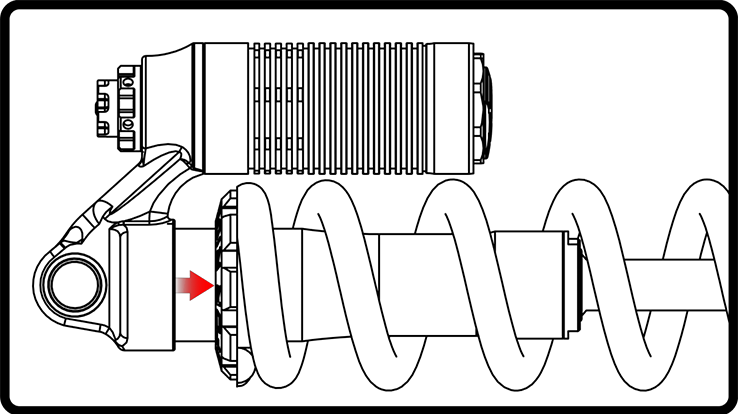 Rotating the preload collar counter-clockwise will decrease spring preload. SAG is the amount your shock compresses under your body weight. Since this is a Downhill specific shock, measure SAG by mounting your bike in the “attack position”. Proper SAG is 25-30%. Below is a chart and steps you can use to easily calculate your sag. 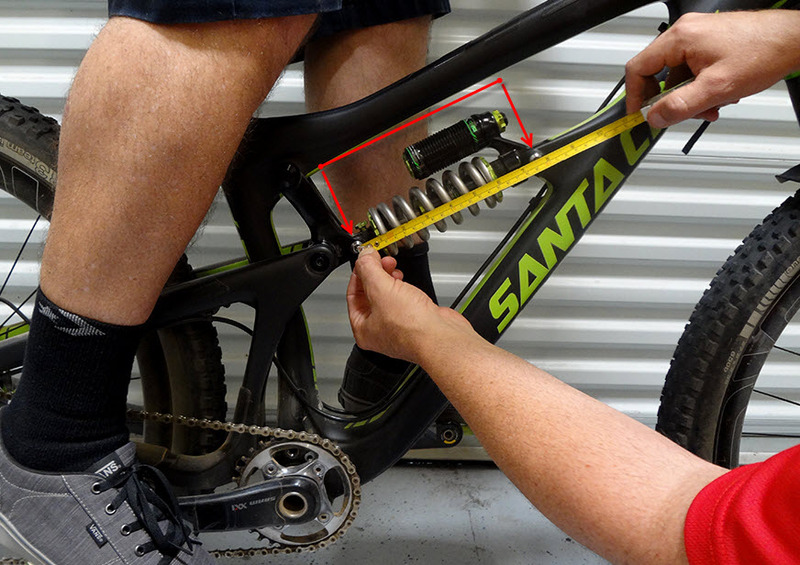 You will need a friend (or someone nice enough to help you) to help you calculate your sag because it can be difficult to take measurements while you are on the bike in step 2. 1. First measure the uncompressed eye to eye length. If you know the size of your shock you will use this number. For example if your shock size is 9.5×3.0″ (240x76mm) then your eye to eye is 9.5″/240mm. 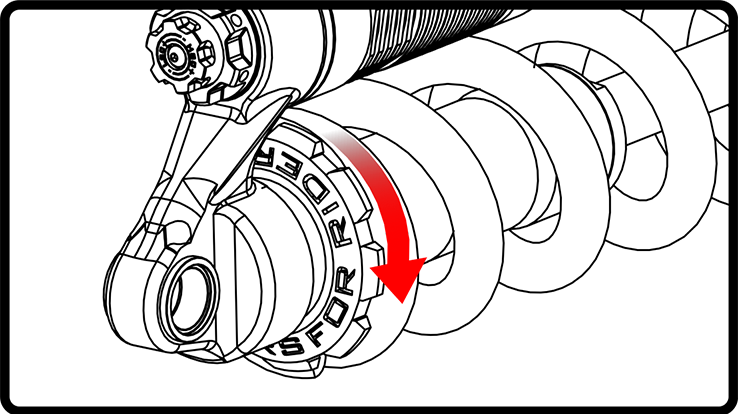 The number 3.0″/76mm is the stroke. The stroke is the distance the shock compresses. 2. Now we measure your uncompressed eye to eye. It might be easier to put your bike next to a wall to help keep your bike stable while your “friend” takes the measurement. While in the attack position measure the eye to eye. Measuring in ‘mm’ will be easier to calculate. If your measuring tape doesn’t have ‘mm’ then inches will be fine. 3. Now calculate the sag by taking the uncompressed eye to eye distance and subtract it from the compressed eye to eye distance. Take the sag value and look at the chart below. If you are between 25%-30% then you have a good starting point. Keep in mind that this is the recommended sag and depending on your riding style and terrain you might want more or less sag. 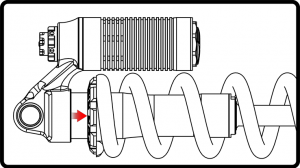 You can adjust your sag by changing the preload or spring rate.